Invoicing and payments problems can take a variety of forms: fraudulent invoices, invoices that don't represent negotiated terms, or just plain duplicates. As your business grows and your vendor list gets larger, how do you stay on top of the validity of each invoice? Join David Wishinsky, Sr. Product Marketing Manager at AppZen, as he reveals 15 critical invoice audit and contract compliance use cases that AI makes possible. Violations of the Foreign Corrupt Practices Act and other similar laws occur when money or other things of value are provided, directly or indirectly, to foreign officials to obtain or retain business. Often times the money needed for a bribery scheme is generated internally within a company by culpable employees, working with culpable third parties, through false invoices and other contracting schemes. This frequent aspect of FCPA enforcement will be the focus of an engaging webinar presented by FCPA expert Professor Mike Koehler. During the webinar, participants will learn of false invoicing and contracting schemes alleged in recent enforcement actions as well as invoice and contract monitoring practices designed to minimize FCPA risk. Travis Andrade, Sr. 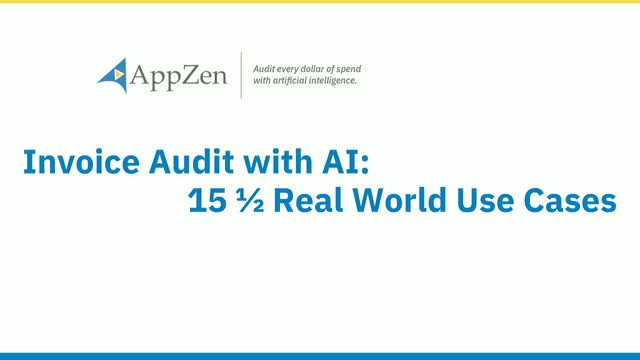 Product Marketing Manager at AppZen, gives a high-level overview of how AppZen audits every dollar of company spend with AI and showcases the capabilities and key features of our Expense Audit Platform. You have a well thought-out expense policy, but is it efficient? Consistently applied? Are errors and non-compliant spend hitting your bottom line? Learn the benchmarks from 1,000 companies in the trending report, "The State of AI in Business Spend". Expense audit authority Charlie Warne will step you through AI-based expense audit how-tos and critical policies for a step-wise function improvement in your expense audit process. Learn the benchmarks from 1,000 companies in the trending report, "The State of AI in Business Spend". Expense audit authority Ray Pell will step you through AI-based expense audit how-tos and critical policies for a step-wise function improvement in your expense audit process. Chris Hester, Solutions Architect at AppZen, gives a high-level overview of how AppZen audits every dollar of company spend and showcases the capabilities and key features of the Expense Audit Platform. If you thought FCPA scrutiny and enforcement arises only from suitcases full of cash, to bona fide foreign government officials, in connection with a government contract, then you are wrong. What makes FCPA compliance challenging for business organizations is that scrutiny and enforcement can arise from normal business activity such as client entertainment if offered or provided to a specific type of customer or potential customer. In this engaging webinar, FCPA expert Professor Mike Koehler will highlight recent FCPA enforcement actions based on corporate hospitality and the compliance take-away points from the actions. In addition, the webinar will highlight the wide-ranging, negative financial consequences that often result from FCPA scrutiny and enforcement beyond settlement amounts and discuss why FCPA compliance is not just a legal issue but more properly a general business issue that needs to be on the radar screen of many professionals who can assist in risk management. KPMG's Guido van Drunen has 30 years of experience in forensic accounting, auditing, finance, and law enforcement. He's skilled in leading and conducting complex financial investigations. He's led global investigations, with 10 years of law enforcement experience in various jurisdictions. In this webinar he will share his experiences monitoring early-stage occupational fraud, and trouble-signs to look forward as the misconduct grew into multi-million-dollar work crimes. Common examples of how employees look to take advantage of companies on their expense reports. Joined by the AI experts at Cognilytica. Join Melanie Gallagher, Intuit's Global Compliance Manager, as she discusses the cutting-edge Consequence Management program she helped install to track and follow up on employee expense report misconduct. Join Jeff Epstein, the former CFO of Oracle, as he discusses practical ways in which artificial intelligence can help your business today. Listen to some of the best and brightest minds in fintech discuss AI and corporate finance.